In response to a public interest litigation, the High Court of Karnataka had directed the Bruhat Bengaluru Mahanagara Palike (BBMP) three months ago to constitute a special committee to monitor its road widening projects and the Metro works. But, the court’s intervention has not impacted the ‘free’ uprooting of trees. The BBMP constituted the nine-member ‘Sustainable Development Empowered Technical Advisory Committee’ in July 2008, under the chairmanship of Yellapa Reddy, a retired officer of the Indian Forest Service (IFS. According to the court’s order, the committee has to take public opinion into account and pass orders on the advice of the experts. The court had directed the BBMP and other agencies working on infrastructural development to consult the committee. The mandate of the committee was to ensure that suggestions, if any, by the public necessarily be considered, provided they were in true public interest, within the realm of law and in furtherance of sustainable developmental works to be carried on by the statutory authorities. The court also ordered that the committee would pass such orders by taking into consideration all the suggestions that may be offered by the members, keeping in mind the various legal grounds urged in the petition. Soon after the constitution of the committee it was observed that the BBMP and other respondents in the litigation (authorities) were carrying on with road widening and related developmental works in violation of the directions of the High Court. In particular it was also observed that massive tree felling was undertaken on Kanakapura Road, Bellary Road, Race Course Road, Palace Road, Sarjapur Road, amongst others. As per the court’s directive, the petitioners — Environment Suport Group and Civic Bangalore represented by Kathyayini Chamaraj — were supposed to be allowed to observe the proceedings of the committee and get a copy of the minutes of proceedings. But they were not allowed to attend even one meeting. On 25th July 2008 the petitioners went to attend the Committee meeting at BBMP. They hoped that Yellapa Reddy, Chairman of the Committee, would consider their submissions favourably if were presented to him directly. The petitioners had submitted representations and interim applications requesting to look into issues relating to the road widening projects. “But such hopes were quickly dashed when he expelled the petitioners, disregarding fervent and respectful appeals that the forum ought to be open to petitioners, in the very least, as much it was to the respondents," said Leo Saldanha, Coordinator of Environment Support Group in a press conference on 19th September. He further added that the proceedings of this committee meeting, signed by the convener R Suresh (who is the BBMP’s Assistant Conservator of Forests) inaccurately and unfairly recorded that the petitioners and their advocate entered the committee meeting by aggression. "Dr Subbarayan Prasanna, a member of the Committee contested this dishonest recording and a decision was taken to strike down that recording by the Chair. However, the Chair reversed this decision in a recent letter to Prasanna and retained the earlier false recording," added Saldanha. ESG has reported violation of some other orders and that convener Suresh was rejecting submissions made by the petitioners on behalf of the project affected communities. In a letter addressed to the petitioners dated 10th September, the convener mentioned that the petitioners did not have the right of participation in the committee meetings. The letter said that all the concerns of the petitioners had been considered in the five meetings held by the committee. A careful review of the committee’s proceedings unofficially obtained by the petitioners, however, revealed that not a single written submission made by the petitioners was considered by Reddy nor have these been brought to the attention of the members in a formal way. Members of the committee expressed their dismay and disappointment over such arbitrary conduct of the committee’s proceedings, according to Saldanha. Some had written detailed letters to Reddy requesting for a proper procedure to be instituted to conduct meetings in a transparent and publicly accountable manner, he added. Carol Upadhyay, a professor at the National Institute of Advanced Studies and one of the committee members expressed her concern that there could be the possibility of bias when the committee listened to issues only from the perspective of the respondents. She also added that transparency was the key point for which such a committee was formed at the first place, but that seemed to be getting blurred in due course. However, Yellappa Reddy refused to respond to any questions when contacted. Convener Suresh promptly said that the committee was following all the rules put by the court and was functioning accordingly. In fact sources say that he sent a letter recently to all the petitioners refuting allegations that the committee’s workings were wrong. Several members have repeatedly insisted that no project should be considered for approval unless they were in full compliance with law and involved the public in decision making. (This was the premise of the original litigation filed in the High Court.) In some instances it has also been highlighted that the minutes were not an accurate reflection of the proceedings of the meetings. But no action seems to have been taken on these allegations. Instead the tree officer and the convener has given further permission to cut more trees without consensus from the committee members. Accidents caused by the BMTC bus drivers in the city have increased about 40 percent compared to last year. 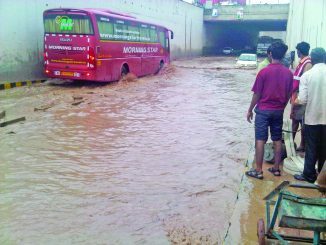 Stung by public criticism at the flooding of a newly completed underpass on the eastern flank of the Outer Ring Road, BDA says it has issued notice to the contractor. I am happy that Environment Suport Group and Civic Bangalore is working to control the ‘free’ uprooting of trees. We all need to support them otherwise our lungs will get choked with carbon-dioxide. Maybe something similar to ‘No Smoking’ ban should be imposed.